00:06:10 Static page or weekly blog post? 00:29:05 External links with a rel="noopener"
00:01:29 Does incomplete Microdata hurt SEO? 00:05:27 Is it a good idea to redirect all broken link to homepage? 00:09:19 Is Google Console the best way to track my keyword clicks? 00:24:01 What to do with the expired events pages? 00:31:26 Should I remove the address from the old website? 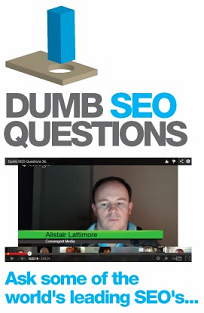 00:02:36 Learn it myself or should I take an SEO crash course? 00:07:34 Which CMS to choose? 00:21:11 Does the content below load more get indexed? 00:06:26 How to track traffic from a mobile app to a website? 00:09:56 Is it wise to paginate category pages? 00:02:06 Disavow site or no? 00:24:02 What should I look for in good content writers? 00:28:09 Do SEO experts also need to know HTML and CSS? 00:40:43 How long before Search Console will show data? 00:26:48 Do I have to submit a page in order to be crawled? 00:29:03 What are the main differences in ranking on Bing vs Google? 00:12:23 People says: "SEM Rush for keywords, Ahrefs for backlinks"
00:01:45 Why they`re not being penalized? 00:16:56 Publish the product detail as it is or do I need to edit it first? 00:27:00 Can I set up only utm_source? 00:31:35 Is it a good idea to use GTM for structured data? 00:36:08 Would this be considered duplicate content? 00:05:41 Ever perform ADA compliance standards on a client site? 00:12:01 Should I switch to Wordpress? 00:16:35 How to rank a youtube video on google? 00:43:46 What is the best advanced SEO guide or book? 00:28:26 How priceRange property for Schema (rich snippets) works? 00:34:42 Is there a Google algorithm update in 2019? 00:05:24 Need opinions on "content randomizer"
00:27:44 Where should we put the anchor tag for a button? 00:06:12 Is it still a good idea to inline small CSS? 00:24:25 What does Silo`ed structure mean in SEO? 00:18:03 Do I need Google My Business? 00:21:00 Should I delete pages with high bounce rate? 00:37:56 Can certain keywords hurt other keywords? 00:02:08 Why there is no Session dimension in GA report? 00:23:26 Does anyone have experience of reverse proxy for Wordpress? 00:46:10 Is the paid version of Yoast worth the money? 00:02:44 Live with the redirect or publish something else? 00:14:21 Do img alt tags have an impact on SEO? 00:02:09 How do I find the back links that may be doing me harm? 00:10:44 How should I write my content? 00:16:47 How many words do I need to beat my competitors? 00:19:01 How important is log file analysis for seo? 00:02:27 Redirect the old page or create a new one? 00:04:07 Parent Page / Child Page or no? 00:07:20 What else can I do apart from writing more content? 00:12:53 SEO 3 Tier Layer structure, will it work in 2019? 00:16:28 Is "Noodp" and "Noydir" still a thing? 00:15:15 Should I remove numbers in URL? 00:33:29 Can you rank in the top 3 on google map pack? 00:01:30 Is there any tool can peep into competitor`s traffic source? 00:29:55 if you change content everyday, can that help or hurt local SERPs? 00:20:56 Can someone explain what is the point of using canonical? 00:25:52 Do keywords in pop ups on websites contribute to SEO? 00:11:46 Is it okay to use generic stock photos for a blog? 00:14:26 What happens if I`m not focusing on local optimization? 00:32:15 Hi Guys, Subdomain or Subfolder? Masatake Wasa (wasaweb): I did not really express myself well in this segment (nothing unusual), but I was attempting to refer to https://schema.org/telephone and suggesting that Example 1 is the one to follow (Phone: (800)555-1234). In other words, mark up the phone number with the international code and full number without spaces, parentheses, etc, but adapt to the local conventions for human visitors. This way, machines will not mistake the number in any way, but will be familiar for human visitor. Perhaps it`s similar to how best deal with dates (marking up as yyyy-mm-dd, but using dd-mm-yyyy or mm-dd-yyyy for human readers).